Although I’ve already done a post on how to press tofu, I decided to do another one, but with a different angle. 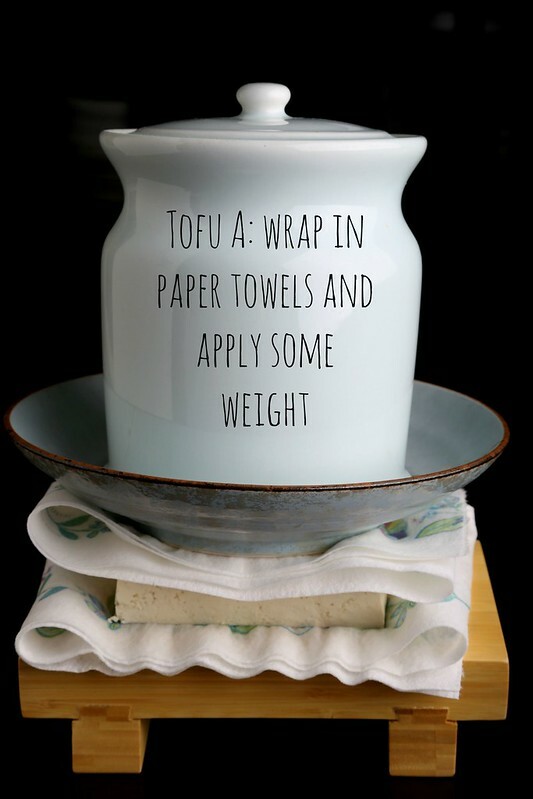 In this post, I wanted to compare towel pressing tofu against the conventional way of pressing tofu, which typically involves wrapping the entire block in some paper towels and adding a plate or something similar on the top, then weighing it down with another heavy pot or cans. If you just want to remove some of the water from the tofu for something like a scramble or fried tofu, this method is perfectly fine. But if you want to marinate it in something, getting out all of the moisture from the tofu is key. The problem with keeping the tofu whole is that it doesn’t sufficiently pull out the moisture from the center. 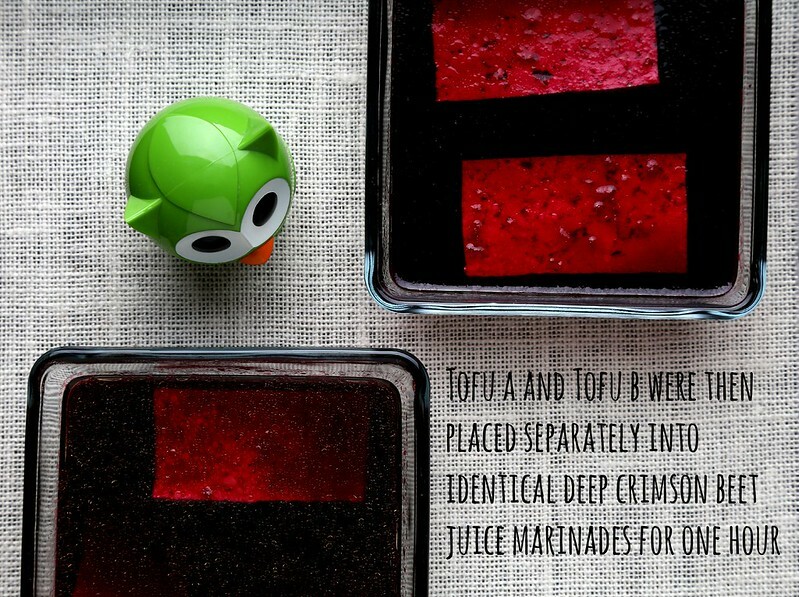 And placing wet tofu into a marinade not only waters it down, but also inhibits the tofu from properly absorbing it. 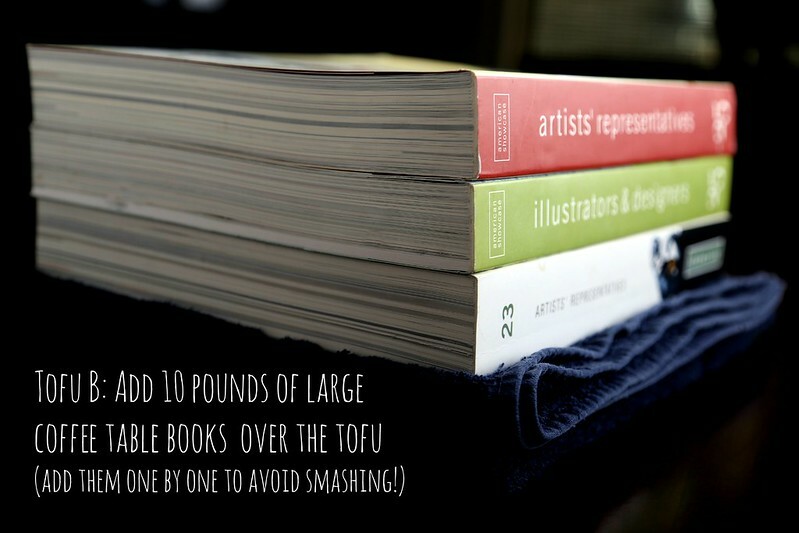 To get around these issues, I cut the tofu (only firm or extra-firm tofu will work here) into four or eight slabs, then use a highly absorbent bath towel and 10 pounds of even weight (large coffee table books are great) to draw out as much moisture as possible. This turns the tofu into virtual soy sponges that will greedily soak up marinades and maximize its flavor. 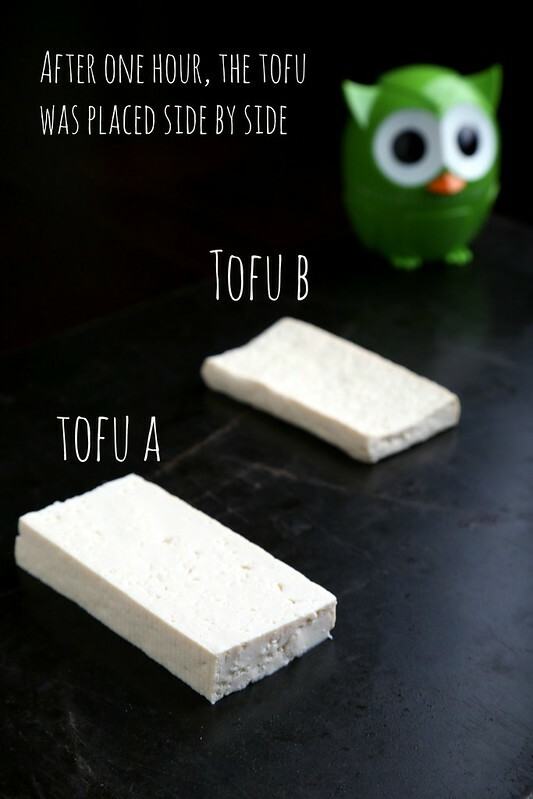 To illustrate the difference, I created two tofu guinea pigs, which I’ve called “Tofu A” and “Tofu B,” respectively. I’ve placed them pressed and marinated (in beet juice*) side-by-side, and the difference was dramatic! 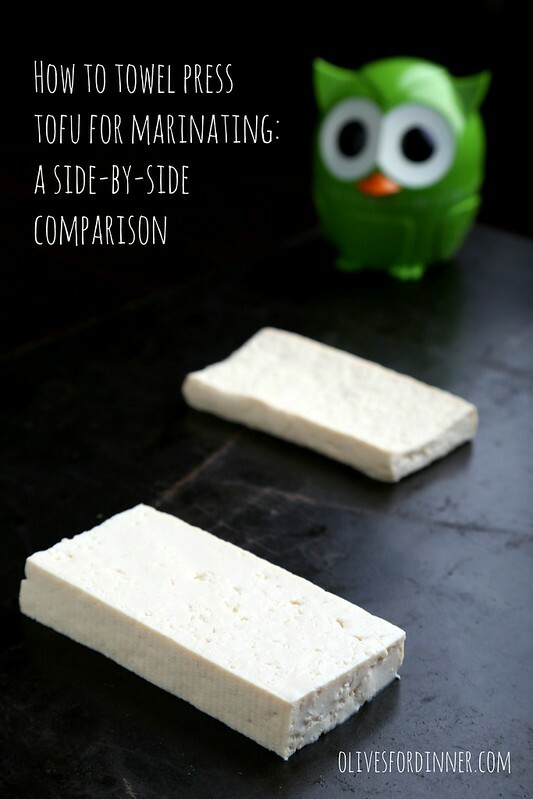 For more ideas on how to use tofu, check out my 15-Minute Quick and Easy Tofu post. *Although beet juice is great for illustrating a point here, I wouldn’t recommend actually using it in a marinade. I use the towel method too, unless I'm pressed (ha ha) for time, in which case I give it a quick smooshing between paper towels. 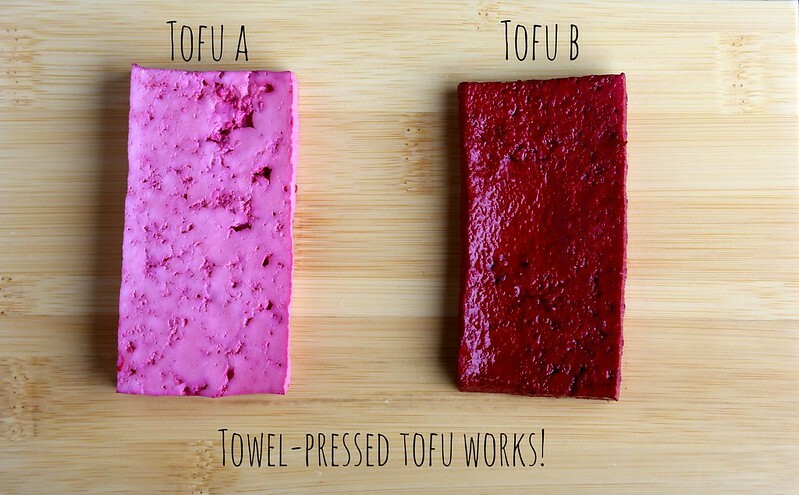 I love the beetroot comparative photos though – they really illustrate the difference between these methods – the colour/marinade Tofu B has picked up is quite amazing! 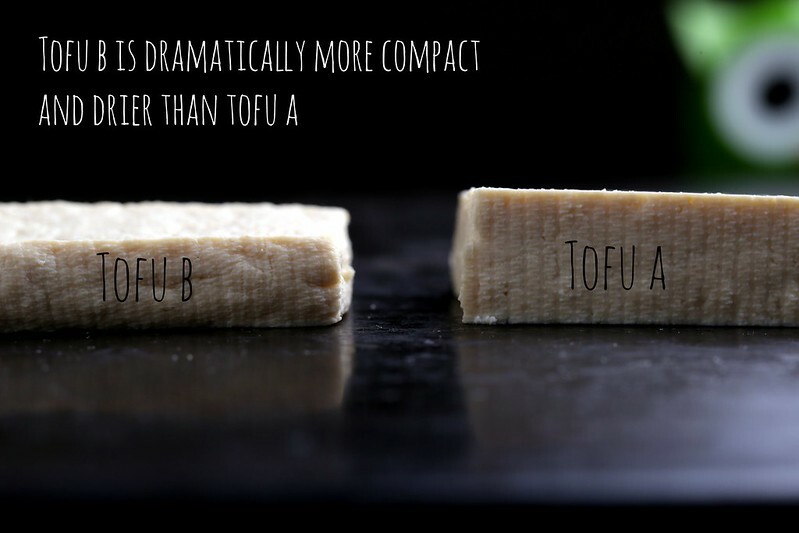 Shamefully, we don't press our tofu often (…or ever). But, this will definitely inspire us to try it a little bit more often. This definitely shows how much can be infused into the tofu. wow!!!!!!! I NEVER press my tofu, because I am lazy and quick in the kitchen. But geeez, that picture with the difference in how much the marinade is absorbed is VERY COMPELLING. Hm. Now you've got me thinking. I have to agree I never press my tofu. I usually buy an extra-firm that is very dry. But the next time I make a dish where the marinade is important I'm giving this a try! Thanks for the demo and awesome pics! hmmmm … we have a cat that sheds like crazy, but I've never had a problem with lint/cat hair sticking to our clean towels or the tofu that's been pressed with it, so I'm not sure what to tell you! Sounds like you need to clean out the dryer vent! You might check inside the body of your dryer as well. Fascinating experiment–thanks! The evidence for the enhanced marinade absorption has convinced me to use this pressing technique from now on. Can't wait to try it. On the cat hair/towel fluff issue: I have 2 cats and their hair is not on my clean towels, usually (unless they jump into the clean clothes pile, which sometimes happens). 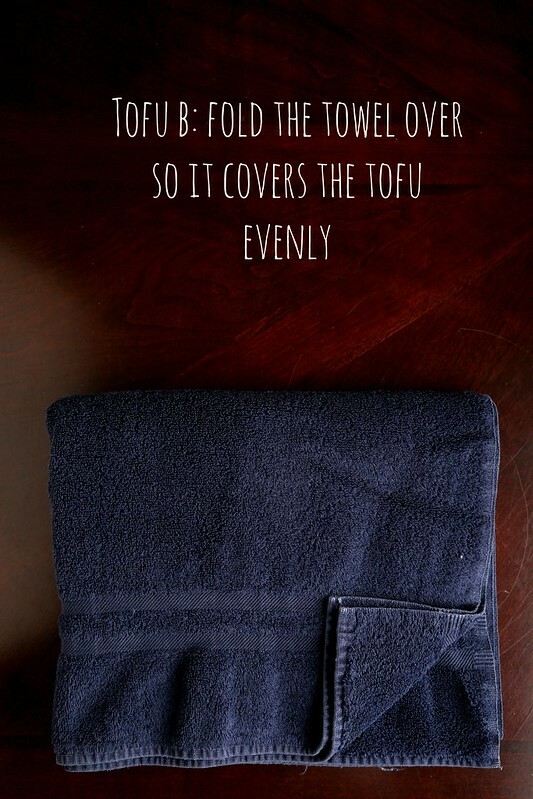 But you could just line the towel with clean cheesecloth or other thin cotton material so the tofu doesn't directly touch the towel fluff, etc. You would still get the towel moisture absorption. But WHERE do you get the amazingly adorable owl timer?!?!?!?!?!?! Like a few other commenters, I never press my tofu! My husband and I just don't have the time to press it, but this was very convincing. You really got me with your scientific approach; I'm going to have to try it! Why not the Tofu Xpress? It's the BEST and works in a very short time. I bought a few of these. The only thing I use them for is pressing tofu. This post is SO awesome!! I always to with method A but I'm totally converting to method B as soon as I get home and get my hands on some tofu! I already love it the first way so I'm super excited to take my tofu love to the next level! I hope you enjoy, Jojo! I find that when I press it becomes very crumbly. Any ideas why? Tamara, How are you pressing it? 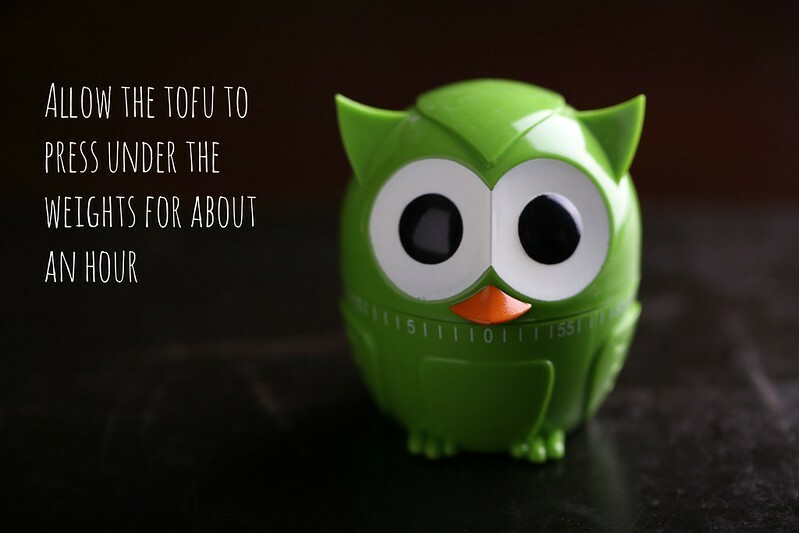 What kind of tofu are you using? Firm? Extra Firm? Does it crumble when you pick it up? If you try this method with firm tofu, you will get dense almost rubbery tofu that's perfect for marinades that sautees and browns beautifully in the pan. It should not be crumbly at all. 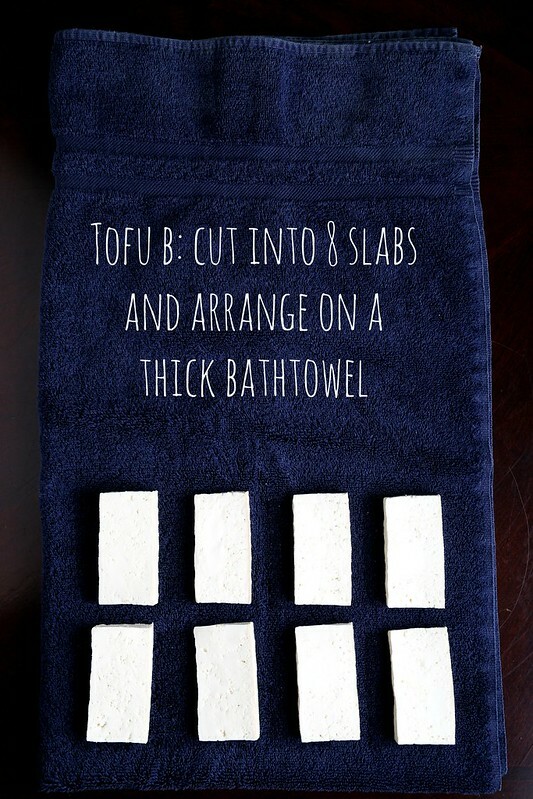 Just wanted to stop by and say that I've been using this method at home and am making the best baked tofu ever! Thank you so much!! it really makes an incredible night-and-day difference with texture and flavor. I used to pay $$ for store-bought baked tofu because I was never happy with the baked tofu I produced at home, this has seriously saved me so much money. Love your blog!! Thanks for your comment, so happy you like! I agree with the comment about TofuXpress. No paper towel waste, no extra towel washing, and the container is perfect for marinating.